Challenge. US West Coast in less than three weeks’ time. 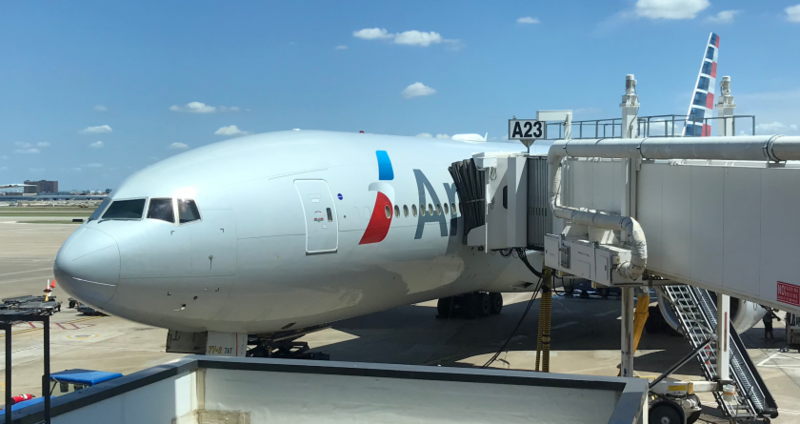 It’s been a while since I’ve written a travel planning post, so I thought I’d focus on how to get some better value business class fares at relatively short notice. One of my friends pinged me last night asking for help. He had some pretty fixed dates as to when he needed to be on the US West Coast, but every fare he was finding was coming out at over £3,200 return. He was looking to travel from the UK on the 18th of November and returning on the 25th and was fairly flexible as to whether he would arrive at Los Angeles, San Diego, Phoenix, Las Vegas, or even San Francisco. As I explain in this post, premium fares, especially at reasonably short notice are always going to be expensive from the UK, so to find a good deal you need to look elsewhere. Whilst his dates were fixed, he was pretty flexible about starting and end points, which makes it more likely to find a better deal. So to help, I headed over to my favourite tool, ITA Matrix. 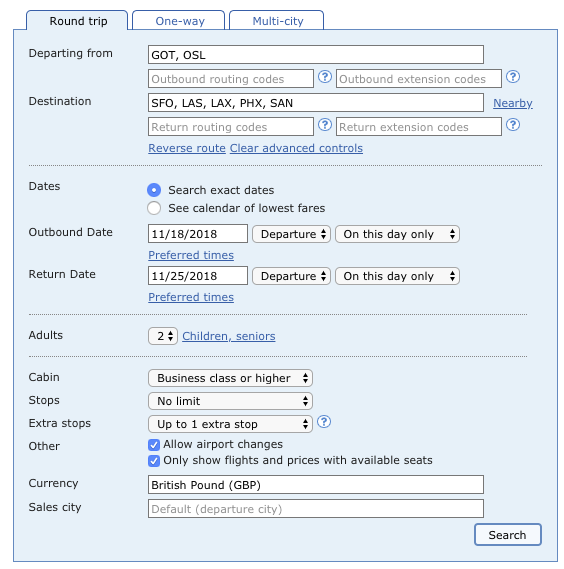 Unfortunately since I last wrote about it, Google have placed a rather annoying artificial restriction on the tool with the intention of driving people to Google Flights instead, which doesn’t offer as many pro tools. The restriction is that you can only search for fares from one country of origin at a time. Previously you could search for fares from (for example), Stockholm, Oslo and Copenhagen, all at the same time. Unfortunately no more. It’s still a very powerful tool, however just means you need to spend a little more time working through things in order to get a decent result. My starting point was to look at fares from the Nordics – typically there have been some excellent deals from Sweden and Norway, with Denmark being a little less competitive than the others. My starting point for a search looked like this. It almost immediately paid off. There was this combination of flights with Swiss from Stockholm to Los Angeles for two people, saving my friend over £2,000 in total. Even adding in the cost of positioning flights, plus a hotel at the airport, he would still be over £1,500 up. I then looked at some other starting points to see what else I could find. Unfortunately this is now a bit more of a process of trial and error. Oslo was next, and it yielded a very similar price with flights on Lufthansa (but bookable via United) over to Los Angeles as well. There were various connecting options, however the transfer at Munich is substantially better than the third world experience at Frankfurt. I started to look a little closer to home as both Oslo and Stockholm are at least a 1h 45m flight from London. Paris proved to be a surprisingly attractive option with reasonably priced flights with Aero Mexico. Whilst not as keenly priced, the 14.10 departure means that you could jump on an early flight or Eurostar from London, saving an overnight hotel. The final place that I looked at was Dublin. This is also a perennial favourite for good value fares. Depending on the routing, you can sometimes also take advantage of pre-clearance facilities there, if travelling directly over to the US. The other possibility with this itinerary is the option to route through London. I would never actively encourage people to miss the last segment of any itinerary they book, however it is an option provided you don’t do it regularly. I’ve written a little more about the options available should you choose to do this in this longer blog post. Even at relatively short notice there are some better value fares to be had, if you’re flexible with time. If you want a single, non-stop flight, especially from the UK, then you’re generally always going to pay a premium for it. Previous Post: Tis (almost) the Season. #AVGeek gifts. Next Post: Six British Airways aircraft to have new Club World by the end of 2019. Colour me confused, or slightly sallow at least. Your screenshot shows your search starting point from 2 different countries, which I thought was one of the things ITA had stopped. Sorry, well spotted. Typo on my part, should have been GOT and ARN!